Both trips in early 2018 with SY Anne-Margaretha to Antarctica and, respectively, Patagonia are mostly fully booked, but there are some last opportunities. There is one female seat in a twin cabin on the journey to Antarctica and one twin cabin still available in Patagonia due to a cancellation. Get in touch with me for further questions or with the Geographische Reisegesellschaft for reservation and booking. Please note that these trips will be German speaking! For this reason, the detailed descriptions are only available in German. There are also some last opportunities for our trips in Spitsbergen in the upcoming arctic summer in 2017. On the long trip with SV Antigua (June 27-July 14, 2017), there is one space in a female twin cabin due to a recent cancellation. There is also the chance to join us on our photo- and hiking tour in Pyramiden in early September (4-11).Also these trips will be German speaking. 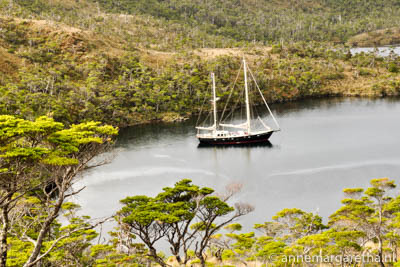 SY Anne-Margaretha in a bay in Patagonia.